'Review for Norway' and is entitled "The Great Grey Owl contemplates the Ingratitude of Foster Children"
From Ken Ball's review of the Millennium Book in the Victoria Club (Australia) Newsletter " For a comprehensive study of the KCS, I urge every KC owner to purchase this book without delay. It is quite wonderful. This Book is something the Breed has needed for a long time. The Millennium Book is produced in full glorious colour, superbly illustrated"
Pauline Vinver-Sharp (Zubaida) "I cannot say enough for everything in your wonderful book, the best we have ever had on the King Charles Spaniel. The beautiful photographs, the exquisite artwork will give a lifetime of pleasure to all who have the book." Sheila Waters (Maibee) "The Book is so beautiful it made me cry when I read it. Thank you for doing so much for the breed"
Michael Allen (Royal Spaniels) "Sensational"
Ron Stewart (Marchog) "The Book is the other side of sensational"
Richard Le Beau (Beauprix) "I had no idea it would be like this. I wish now I had put 4 pages in. Congratulations to you and your assisting writers upon the completion of the Millennium Book of the King Charles Spaniel. Just as Lady Wentworth's most thorough book, written nearly 100 years ago, this new book will surely become an essential resource for the breed fancier long after the time of its publication. As I had seen the Millennium Book of the Papillon I knew we would be thrilled with a most beautiful,artistic and informative book through your enthusiastic efforts and focused attention. I don't know how you did it! And I wonder just why you undertook such a huge task on behalf of a breed which is quite small numerically and usually overlooked by the typical judge in the show ring today. The book is a boost to fanciers, and successfully promotes the idea of international unity for the dogs." John Fothergill "Many congratulations on the Millennium Book of the King Charles Spaniel"
Christina Van Patten (Royalist English Toy Spaniels) You have done an unimaginably beautiful job with this book and I am completely in awe of your combined talents! I cannot complement you enough on the book - I pour over every page, relishing all of the marvellous information, beautiful drawings, and lovely pictures. Thank you so much for your effort on behalf of our breed. Kathy Dannel (Jackpot! French Bulldogs) I must agree, the book is fabulous. I thoroughly enjoyed every single page and am sure I must have another copy. One to save and another to read and reread! It is well done from a production standpoint and such a wealth of information. There is so little current information on the breed, I have been starved to learn more and I thank you! Caroline Gurtner (Melcourt) This book is simply wonderful. All these articles from all around the world : this is incredible and so interesting. Many congratulations. Jackie & Peter Portingale (Jacrianna) We appreciate the hours that you and your fellow team members must have put into this.This is definitely a book to be treasured. Thank you again for your input and effort. Louella Eva (Sophyla Manchester Terriers) I think that the book is a tour de force. I don't think I have seen anything done better before. I just sat down and read it. The cost of advertising and which publication to put your advert in is a thorny one, there is no doubt that you reach a very large audience with the dog papers, but it is pretty transient. The thought of being in a book like yours is surely better. Marit Tveit (Kennel Gracienda) Many congratulations with a wonderful book. Gina Martin (Normanslea) I have not changed my first impressions- I think it is a beautiful book and I am proud to add to my small collection of 'charlie' and dog books. There is much more to read than I thought there would be, and I particularly liked the articles on collecting and health issues. The Art Work is super and must have taken hours of work; the quality of reproduction of the photographs is very good too. My only criticism is of the binding-I don't like the spiral binding, you have to be very careful when turning the pages (** see Editors Note below) and I feel that in years to come the pages could come adrift. Also on my copy the Back cover seems to have been punched wrongly, it does not cover the inside pages properly. Apart from this I think it is a lovely book and those who have not advertised will be sorry they missed the chance. ***Editors Note The Spiral binding for this Book is in fact very strong and should cause no problems. Some people do not care for spiral binding but, apart from ring binding (which is only suited to a loose leaf format) it is the only type of binding which will both hold a book of 275 pages and allow it to be opened flat. It is not always realised that a spiral bound book must be turned over left to right always. There is no fault with the back cover but after you wish to close the Book it must always be closed left to right - the back cover should not be turned right to left. In other words always open and close from the front cover not from the back. Incidentally we are considering having our next Book - possibly the Millennium Book of the Pekenese - boxed in board covers. Chantal Dumortier (De La Rivieroise) At last a marvellous book about OUR King Charles. Thank you to all the great Breeders ( Mdmes Pennington, Fry, Schillizi, etc...) for all the advice and old Photographies. Thank to Deirdre for all Lovely drawings, and her gentleness ( by E.Mail with me !) A Marvellous BOOK !! So this book will improve "my English" too. VERY BEST WISHES. Kathy Dannel (Jackpot! French Bulldogs) I have read, re-read and then read again this wonderful book! Very well done and a wealth of information to both newcomers (like me) and veteran Charlie lovers! Thank you, I KNOW how much work goes into a book like this! John R Wood & Jerome A Elliott (Cheri-A's) We are thrilled with ours, as we have told Deirdre a number of times. This is the most complete historical record of the breed to date, and we certainly appreciate all your efforts in pulling this magnificent production together! We are encouraging others to get their copies if they have not already done so!! I am by your magnificent publication!! I can hardly let it out of my sight for a moment! Sheer delight to the eye and I know many hours of fascinating, fun reading ahead! Beautiful, beautiful book! Truly words fail me...This thrilling publication will surely be wanted by all who know of it! thank you so very much! Cheryl Abbott (Davidswood English Toy Spaniels and Camino Real English Toy Spaniel Club) The Millennium Book of the King Charles Spaniel is absolutely stunning. I cannot find enough good things to say about it! The artwork is glorious, the wonderful collection of photos of the "foundation" lines of the breed are to be cherished and gives us all something to strive for in our our lines. I have gone through the book three times now and each time found something I had missed before. I have smiled, cried and caught my breath at the beauty of our little breed. Thank you so very very much. It will be a treasured part of my King Charles collection. I think there will be many people kicking themselves for not being part of this wonderful, collectible work - it is something to be proud of. 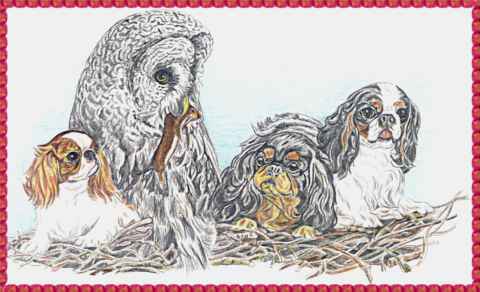 Joan H Eagle (Glen-Airey Scottish Terriers, USA) The latest Millennium Book of the King Charles Spaniel is 'choc-a-bloc' full of information, glorious illustrations by the Editor and well supported by the many breeders world-wide with specimens in the well produced and attractive adverts. The paper is of excellent grade and the text is not only enjoyable but the choice of print makes it pleasingly readable. No attention to the smallest detail has been overlooked. This Book is a must for all owner/breeders or any other dog lover or collector of breed books. Margaret Mallows (Binglui Pekes,UK) I must congratulate you all on such a wonderful edition, and can't wait for the Pekingese one. Shirley Whitton (New Zealand) It is just beautiful and I would like to congratulate you and everyone connected in putting it all together. Unfortunately there is not a lot of information on the KCS compared with other breeds so this book is particularly special and so well put together.It's a must-have book for every KCS Breeder as far as I am concerned and I thank you for taking the time and making the effort to produce such a wonderful book. Thank you from a grateful King Charles breeder.